Lindsey Vesolowski is a junior at California Baptist University, and when she joined their speech and debate team last fall, her professor told her she had the opportunity to write a speech on anything she wanted. “Why not write about something I am passionate about?” Lindsey thought, and she picked the topic of animal abuse in circuses and highlighted the Traveling Exotic Animal Protection Act (HR 3359). Introduced by Animal Defenders International (ADI) with Representative Jim Moran (D-VA,) this federal legislation aims to protect wild animals from being forced to perform in traveling circuses in the US. 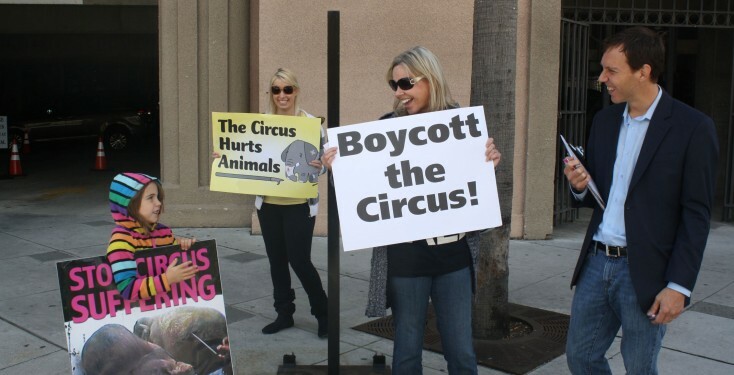 Lindsey had participated in protests outside performances of Ringling Bros. and Barnum and Bailey the previous summer. “Seeing the animals look so miserable stayed with me,” Lindsey said. “I wanted to give them a voice.” She told her professor the topic and he was very responsive towards it. Lindsey went to three tournaments with that speech, each time getting a shocked response. Competitors approached her after each tournament and told her they had no idea what happened behind the scenes at circuses, that they would not be attending any more circuses, and that they were going to support the Traveling Exotic Animal Protection Act. Lindsey is pictured above with ADI’s Campaigns Director Matt Rossell, her mom Cheryl and Matt’s daughter Felix at a recent Shrine Circus demo in Los Angeles. You don’t have to join a speech team to find creative ways to incorporate outreach for circus animals in your everyday life. Contact ADI for business-sized Break the Chain outreach cards which have a link to our Action Alert for the Traveling Exotic Animal Protection Act. Keep them in your purse or wallet, then, when you are talking to family and friends about the plight of animals in the circus, you can hand them a card with an easy action for them to make a difference.